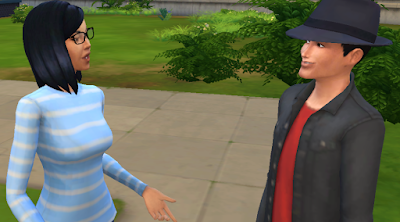 The next day, at noon precisely, Yuri was stood outside the art gallery, anxiously checking his watch. He clutched a single red rose in one hand. Crystal was nowhere to be seen. "She must just be running late," Yuri told himself. "She can't have stood me up. I mean, she couldn't. She wouldn't. Would she?" He needn't have worried. A few minutes after twelve, Crystal came sprinting down the street, desperately trying to catch her breath by the time she reached Yuri at the gallery entrance. "Sorry... bus late... ran here.. sorry..." she explained between gasps. Yuri waved his hand dismissively, but politely. "It's OK," he replied reassuringly. "I'm just glad that you're here." 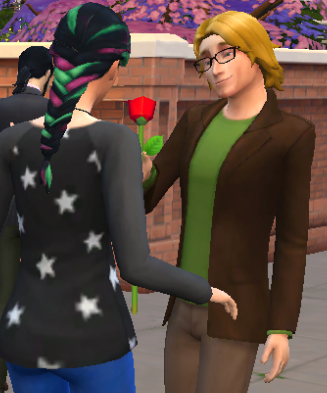 He reached out his hand, offering Crystal the rose. Smiling, she took it from him carefully, touched by the gesture, and grateful for the gift. "Thank you," she said, now full recovered. "I just adore red roses!" Yuri offered her the crook of his arm in a mock-gentlemanly fashion. Laughing, Crystal slipped her arm through Yuri's, and allowed him to lead her into the gallery. Saturday might have been Michael's day off, but his mind was still very much at work. As he sat in the living room of the house he shared with his brother, half-reading a book, his brain raced with thoughts about the recent thefts. "Commander", "Commander"... it was the same thing over and over again. There had been a few crimelords in the area before - "The Boss", "The Guv'nor", "Mr. Big" - but this "Commander" was a new one. Although he - or indeed she - was clearly the link connecting everything together, their motives were unclear. Not to mention... how the heck were the Commander's gang actually pulling the robberies off? No forced entry, no victims harmed... Sherlock Holmes himself would be baffled. However, Michael had never been beaten by a criminal yet, and he was not going to let this "Commander" be the first. The sound of the doorbell ringing roused him from his reading/pondering. Michael looked up at the door, confused. He was not expecting any visitors, and surely Yuri couldn't be back from his date yet... unless he had done something very, very stupid. (Quite frankly, having known Yuri since his birth, Michael was not going to put that possibility past him.) Still, the papers reporting the thefts had made it clear the police had their "best man" on the case... and almost everyone in town knew that man was Michael. Perhaps the "Commander" had come to deal with him personally. Slowly, Michael rose from his seat on the sofa, and took large, cautious steps towards the door. Bracing himself for a possible fight, he gripped the door handle with one hand, curled the other into a fist, and pulled the door open. A kindly face, wearing a shy smile, greeted him. "Oh - hello!" Michael's visitor said. "I've just moved in a few doors down... I thought I should introduce myself to everyone in the neighbourhood. My name is Megumi Hasekura." Michael examined his visitor carefully. She certainly seemed to be telling the truth, and her greeting had been very friendly indeed. However, the thing that truly assured him he was safe was the absence of that strange "feeling" he had gotten around the robbery suspects. That said, another feeling - a bizarrely warm and happy feeling - had now started to spread through his body instead. This new feeling, although he instinctively knew it was good, arguably confused him even more. It was one he had never felt before. Megumi couldn't help but wonder why her new neighbour was looking at her so closely. Thus far, he had not said one word. Upon noticing his clenched fist, she became somewhat anxious. "Is... is this a bad time?" Michael's eyes suddenly darted toward his hand. Realising he was still "battle-ready", he quickly unclenched his hand... and found himself chuckling awkwardly: something else completely new to him. "Oh... oh no! You are not bothering me at all!" he replied, quickly unclenching his fist and wiping his hand on his jacket. "I... I was expecting... somebody else. I do beg your pardon, Miss Hasekura. My name is Lee Harker - Michael Lee Harker." He reached out his hand for Megumi to shake. She did so, smiling. "'Hasekura"..." Michael said, after a moment's thought. "If I may, Miss... might I ask... are you Japanese?" "Yes," Megumi replied. "I was born here, but my parents are from Japan." "In that case, Miss," Michael said, "then may I say... Yoroshiku onegai itashimasu." "Kochira koso!" she answered. "Do you know a lot of Japanese?" "I know several languages, Miss," Michael told her. "Japanese, Russian - that is my mother's nationality - French, German..."
"Not yet," Michael replied, "but give me an hour, then ask me again." "You're so funny, Michael!" she told her new acquaintance. "In fact, your name - that is, "Lee Harker" - rings a bell with me, too. Do your parents work at the science lab?" "I thought so! So do I! Professor Gabriel Lee Harker is my supervisor. My. my... it's a small world, isn't it?" Michael soon realised that he must not have said anything in a while, as Megumi was once again looking at him with a concerned expression. "Are you sure I'm not bothering you?" she asked, worried. "No, Miss!" he replied hastily. "Not at all, I assure you! Please... forgive my rudeness. It is just that... I have things on my mind. You see, I am a detective, and..."
"You've been working on the recent thefts." Michael looked at Megumi, stunned. "Oh, I read about them in the paper," came the reply. "I think just about everyone on the force is dealing with those at the moment. Still, it's all rather strange, isn't it?" Michael nodded in a rational fashion, but inside, he was relieved. For one moment, he had feared that his instincts about Megumi had been wrong, but now, her knowledge of recent events had been revealed to be perfectly logical. "I realise that you must have a lot to deal with right now," Megumi said. "Perhaps we could have a proper chat another time, once you're feeling better?" "Oh, yes, Miss," he answered. "I would like that very much." "There's no need to call me "Miss"," his new friend answered. "My name is Megumi. If you ever want to talk to me about things, I'm only two doors down - OK?" "Yes, Mi - Megumi," Michael said. "Thank you for your visit." "No problem. See you around." Smiling, Megumi waved goodbye, then walked towards the next house. Michael, meanwhile, headed back inside - that strange warm feeling now stronger than ever. 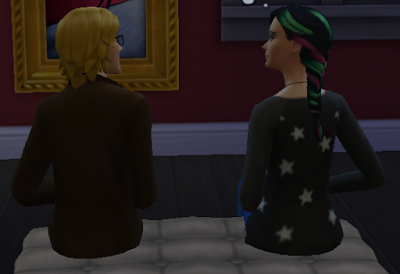 As Yuri and Crystal walked around the gallery together, they each focused on very different things. Whilst Crystal carefully examined paintings and sculptures and appreciated the great works of art on display, Yuri paid far more attention to the beautiful features of his date. After a hour or so of exploring, both parties had begun to feel a little exhausted. And so, upon spotting a cushioned bench, the pair sat down together, taking the weight off of their tired feet. "I've really enjoyed today, Yuri," Crystal said softly. "Everything here is so beautiful." "Yes," Yuri replied, looking straight at Crystal. "It certainly is." Crystal blushed, and turned her face away, embarrassed, but pleased. After a few moments, she reached out her hand and gently took hold of Yuri's, before looking up at him once again, her eyes meeting his. They said this way for some time. Neither Yuri nor Crystal said a single word - they each understood the powerful silence between them, and what it meant. After a while, Crystal rose to her feet, slowly pulling Yuri up with her. She reached out towards his face, and gently brushed his cheek. "You know..." she said, "I don't think I want this date to end." "Neither do I," Yuri replied - his voice barely more than a whisper. Another quick glance followed, and then, suddenly... Crystal's lips were on Yuri's - their mouths locked in their first, tender and gentle kiss. 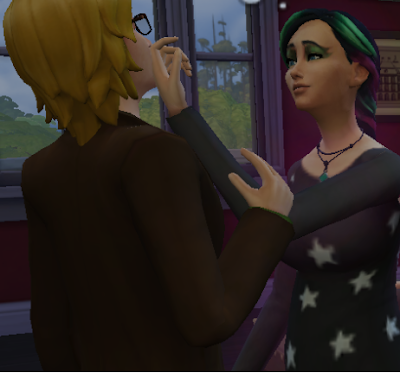 When Yuri suddenly moved, Crystal feared that he was about to pull away from her. Had she acted too rashly? Had she misread Yuri's signals? However, Yuri had merely moved in order to wrap his arms around Crystal, pulling her into a closer and deeper embrace. He broke away only briefly, to say something to her. "Come back to my place." Crystal nodded, and the pair resumed their passionate kiss.